The music animates the dancers, who reach over the railing, reach away from the audience. They are setting the tone, making the invitation into the 45 minutes ahead. A dancer steps onto the rail as other dancers support her, a moment of release that gravity ends. Dancers drape themselves on the railing, on one another—a posture of grief, resignation, and communal comfort. Ushered back into the building, Mabus tells a small piece of the story behind the funeral home, how Angela and Felix Morales opened it, how Angela kept it open by earning her own mortician license when Felix was called up to fight in World War II. Mabus tells the story over Adam Casteneda lying on the floor. At the end of the telling, Ashley Horn Nott rouses him by grabbing the front of his shirt and pulling him up. The duet that follows is romance and trading support. There are moments when Ashley supports Adam’s full weight on her back. It is a striking visual to illustrate the way Angela Morales kept the business alive during the war years. Beyond the entrance way, there is a small sitting room, a hallway, and beyond that a larger sitting room just outside the chapel in the back. 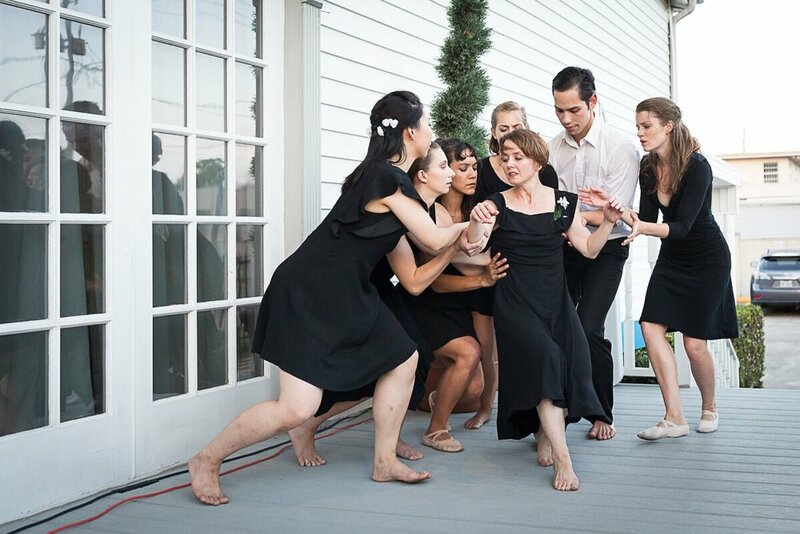 The audience is ushered into the full length of this passage way, where dancers express their grief, tell their stories of loss with their movements. A rhythmic rendition of “I’ll Fly Away” by Rising Appalachia lifts us out of the sadness and into hope beyond death. Ushered back towards the smaller sitting room, another duet unfolds, Emily Roy Sayre and Donald Sayre dance a story of a man’s failing health. Emily catches him several times as he sinks, only to lift him up again. The final time he sinks, Mabus rushes in to help lift him but then escorts him away, which I read as Death coming in to take him. It was a quiet yet startling moment, poignant with the gut punch death brings. If I were to name one moment, this is the one that will stay with me long after this review is posted. Again we are ushered down the hallway, into the chapel, into its pews. The space and movement reminded me of some of the best liturgical dance I’ve seen, a communal expression of grief and hope in a worship setting. At one point, dancers at the front reach over a front barrier into the front pew, echoing the reaching movements over the front port railing at the beginning of the program. They dance out a doorway to the right and again bid us to follow. Here we enter a small space with a painting of the Virgin Mary with a table beneath, a kneeler pushed up to the table. The table bears two potted peace lilies. It’s an elegant makeshift altar for those wishing to petition the Virgin in their time of grief. Appropriately, the room is awash in the scent of roses, a scent associated with Mary. A spray of white roses is the source of the scent and after the devotional dance is complete, the dancers remove a rose from the spray and lay it on the table beneath the painting. We are led once more to the long hallway along the western wall of the home and the dancers echo the movements we’ve been witnesses all evening, a moment that felt like a reprise and a benediction. But it was not the end. Ushered out again to the front porch, where we began, Jennifer Mabus dances a solo, a piece that speaks of pain and hope and release and community. She balances, reaches, extends, surrenders. I watched this program twice, at the 6 and 8pm showings. I found the darkening humidity of the 8pm showing to be a different experience from the still-full-daylight of the 6pm showing. The rhythm and hum of the traffic on Canal was different. I wondered what the people waiting at the bus stop in front of the funeral home made of us. I suspect the audiences at the earlier showings, at the hottest time of the day, experienced something slightly different still. As a dance writer, I like to give a sense of the shape of an event. I like to report as much as review. Having done that, I would say just a bit more, pull out a few more observations. The movement vocabulary for the evening had a lot of reaching down and reaching up. What was interesting to me was how I received these repeated movements throughout the 45 minutes. At times I experienced them as grave digging, other times reaching into the underworld itself, perhaps even washing in the River Styx. There were moments that felt like the dancers were gathering up all the weight and dirt of our lives and then releasing it into the air, a gesture of offering or thanksgiving. The rhythms of the evening were varied enough. We were primarily shown the tender moments of grief, the gentleness that, if we’re lucky, we experience from our communities when we are mourning. The moments, as with “I’ll Fly Away,” where the dance is more animated, they still had a quietude to them. But there was one moment, at the end of the section in the chapel, which spoke to me differently. As the main company led the way out, Mabus lingered behind. She performed a burst of movement, brief and sharp. It would have been easy to miss, being disconnected from the rest of the company. It was so quiet in its bursting. “Ah yes,” I thought. “There’s that private moment when grief is hard, flailing, private.” I was glad I caught it. It reminded me of my own private times of grief, when all the community support and gathered ritual could not reach me and I had to be in it, indeed move through it, alone. 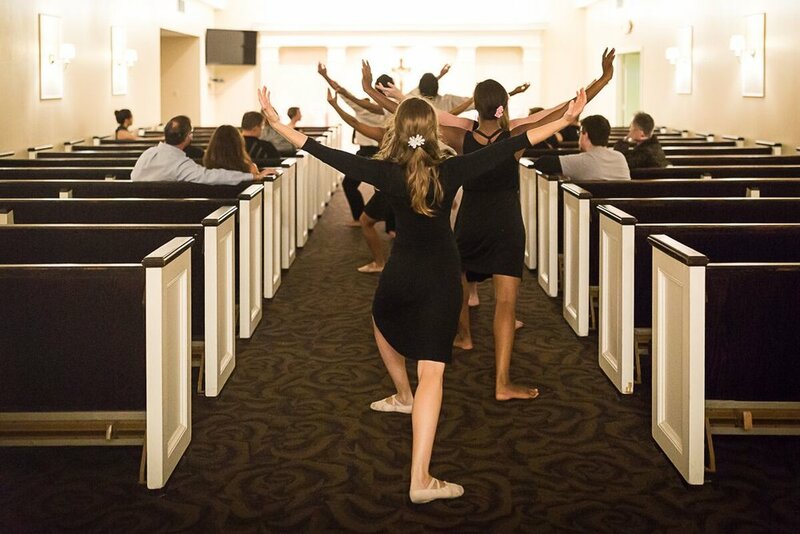 This Requiem, a dancing through a funeral home, was a brief but powerful event about loss, witnessed and experienced. Some audience members were moved to tears. It was an art piece that perhaps brought up old, difficult emotions (or recent ones for some), but also showed the movement through them. Jennifer Mabus reminded us that grief is a journey we take, communally and individually, to emerge into the life that goes on.